This Bruder Defender combines fascinating off-road qualities with the timeless elegance of Land Rover's design. Like all our vehicles, every detail of this new model is true to the original. Thanks to its surprising details including the raised structural plate on the engine bonnet and its numerous fully operational features, the model will convince both fans of the Land Rover brand and anybody who appreciates attention to detail. Apart from the engine bonnet, which provides a view of the detailed engine block, the rear and side doors can be opened, while both the rear bench seat and the drawbar coupling can be removed. Thanks to the suspension on both axles, the toy model of this vehicle easily masters any terrain just as its real-life brother. What is more, the front axle is steerable thanks to the additional steering column (included) known from BRUDER's tractor series and, thereby, makes controlling this vehicle mere child's play. 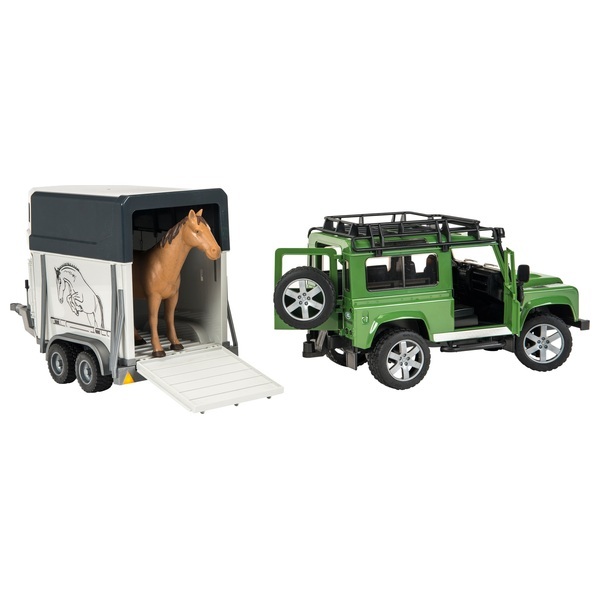 The vehicle is also very attractive for fans of euestrian sports as it combines off-road capabilities and stylish design with the ability to hitch up a horse trailer.